A new bracket is starting up, called The Central Havoc Invitationals, featuring RA3 as their first run. If you think your team has what it takes, check it out. "The league�s first season will be open to teams from all over North America. We invite competitive teams from any mod to come register." Though unfortunate it is currently limited to players in the North Americas, prizes include GeForce 6800's and other powerful goodies. Welcome to id Software's Finger Service V1.5! Yes, this is the official word that DOOM 3 has been code released and has been approved for manufacturing! It won't be long now until the anticipation ends and the PH34R begins ;-) We literally just hung up with Activision and have confirmed that our latest release candidate has been mutually approved and is finally GOLD. Thanks to everyone for their patience (yeah right! =) and for everyone at id, Activision and our numerous partners for helping us create what I believe is absolutely the best game we have ever made. So, the next question is release dates. Retailers in the States will be allowed to pick up games starting at 12:01 AM on August 3rd. The official street date is actually August 5th in the U.S.A., but some of your favorite stores will probably have it early for those of you who have to have it first. Check with your local retailer for that information. Internationally, the game will take a few more days to make it to the store shelves. The UK will probably get it first, on or about August 6th. Everywhere else will probably be Friday, August 13th (que Twilight Zone Theme) or close to that date, with just a few exceptions (e.g. Russia and Poland). This isn't because we don't have love for you folks outside the U.S., but the localization and manufacturing process takes a bit longer outside the U.S. where we will have JVC run 24/7 to get the units built. I guess the European manufacturers prefer to give their employees nights and weekends off. Go figure! The champagne is flowing here at id and smiles abound! Recapping today's headlines....DOOM 3 GOLD!!! Full press release is here. I couldn't stop myself from posting that! :) At last, time for me to upgrade my computer! After getting much feedback (or complaining) QuakeCon.Org has updated the Q3 CTF maplist to the following: q3ctf2, q3w2, q3wcp1, q3wcp9, and q3wcp15. Leave a comment on what you think about that if you are playing, so far they are intresting. Of course, full tournament details and more on the QuakeCon site. Q3 Modelers might want to swing by the Chumbalum Soft site to check out the latest update to MilkShape 3D. Lots of updates, and a few new features. Just don't forget to keep it refrigerated. ydnar survived his bike trek across the US, and back in action pushing out another update to Q3Map2. Along the fixes some some new toys for mappers. Swing by SplashDamage Forums for all the details, and a picture of ydnar half way to LA. $150,000 IN CASH AND PRIZES UP FOR GRABS AT THE NVIDIA� CHAMPIONSHIPS AT QUAKECON 2004"
Now if that does not scream a good reason to go to QuakeCon, I am not sure what does. Amoung the toureys will the the first ever DooM3 tourney, Q3 One on One, and Four on Four Q3 CTF. Hope to see you there. The staff of Q3Arena.com would like to wish everyone a very happy 4th of July. May your celebrations be both fun and safe. After the better part of two and a half years, the World of Padman mod team has finally released their cartoon fun mod! The mod itself weighs 335MB and has plenty of mirrors available for both the Win32 and Linux/Mac versions - and some game servers listed for you to try the mod out with. Latest results from ClanBase Q3 DM Nations, Russia beat the UK 2 - 0. Maps played were ospdm5 Russia's choice, q3dm14tmp UK's choice. Full game details and screenshots on ClanBase Q3A DM Nations page. Burial Grounds have finally released the results from the BG-COMP1 Map Comp! "With 10 maps submitted you would think this would be easy. Well, what we lacked in quantity we more then made up for with quality...however there could only be one winner and today it's Daniel 'ALMighty' Alm with his map Arena 13." Runners up were The Last Arena by Grudge in second, and Shake Your Body by Strahlemann. All the results are ready for your viewing pleasure here, on the Burial Grounds Site. The folks over at Urban Terror patched up an expliot for us with a 500kb update patch, bringing the current version up to 3.6. Check out the site for details and download locations. Clanbase reports that Q3A CTF EuroCup IX playoffs kick off tonight. Poll was in favour of FOE vs reCap at 19:00 CET. Check out the EuroCup IX page on ClanBase for the details and info on upcoming events. PainKeep Arena 3.0 has been released today, along with goodies for level developers. "Would you like to make a map filled to the brim with pain and despair? Now you can! We have also released the source materials for the Level Designers to create their own masterpiece Painkeep maps!. The source materials will enable Level Designers to develop PainKeep Arena maps using a custom entity file as well as map source from a production map." More information and downloads on the PainKeep Arena website. In understandable terms, now is the time to signup for QuakeCon 2004! You can read the newly posted FAQ about QuakeCon on the official site, QuakeCon.Org if you have any questions about the event. Hope to see you there! This has the time to update your mods, and here is yet another one. PainKeep Arena 3.0 is ready for download. Sporting twenty new arenas, new set of weapons and much more. Head on over to the PainKeep Arena site for all the details and downloads. This past friday Urban Terror 3.4 was released for Q3. This is to be the last update for the Q3 version since now they are putting work into Urban Terror for Enemy Territory. Also this afternoon Navy Seals 1.91a for Q3 is to be released. "In previous versions of Navy Seals, we had 2 different scopes, one for seals and one for tangos - by far not realistic. Therefore we now have different scopes for M4, AK47, M14, PSG1, MacMillan and SL8SD." That and plenty more game enhancments to show up this round. Stop by the Navy SEALs: Covert Operations site for all the details. Well, do or die, i'll release 1.7 on monday the 29th of march. It'll be 1.7 RC4 + very minor changes fixes. At last, an update to my favorite mod! For anyone intrested in the Excessive Overkill mod by Mr. Pants, one of the greatest time killing mods out there, the source code has been released for your viewing pleasure. Take a gander past Mr Pants Excessive Overkill for the goods. QuakeCon 2004 Plans are set! It is that time of year again, well, the time to start planning for that time of year. Going to QuakeCon is any players dream. Start putting those plans in line, LAN dates set for August 12th tot he 15th in Mesquite Texas. Head on over to the Official QuakeCon site for all the details. Database player stats tracking and more! Check out the Rocket Arena website for downloads and details. Fixed a bug in the sky portal code that prevented it to work in certain situations. Fixed a "Bad gEnt" bug that would cause a crash. New sun flare effects, with options to control the sun flare size, opacity, sprite count. New impact effects for snow and grass surfaces. You can read up on all the features to come out in v3.2 March 13th here, on the Reaction Quake3 site. Got anything planned for May 8th? Burial-Grounds is hosting their fourth LAN party! For $25US you too can to eat and frag. Hey if you plan to be somewhere around Massachusetts in May why not? You can catch all the rules and other info here at the Burial-Grounds. That's right, and soon Friday Night Frag Fest will be in full swing. Tonight the FnFF servers will be running Excessive and Instamush. Check out the times and map rotations here. Hope to see you there! Calling all mappers: Ydnar has released an updated Q3Map2, version 2.5.13. One of the coolest features looks to be the new Convert, so you can take a Jedi Academy map and compile it for Enemy Territory for example. Get the whole scoop over on the Splash Damage Forums. Which is better, Quake or Duke Nukem? On The Ultimate Gaming Grudge, where gamers vote for their favourite games, that is exactly what we can tell them... Quake of course! Jump in and vote! The initial release for Freeze For All is out for download. This is a server side mod which supports Q3, Q3:TA and Star Trek Elite Force. What makes F4A slick is the amount of tweaking you can do to get the server set up exactly how you like. Take a swing by their place for all the details and downloads. tIKi_mAn will now be takin care of Q3Arena.com for keeping up to dates with everything that is going on in the Quake community! Welcome aboard tIKi_mAn! It is with great regret that I am announcing that this will be my last post on this webpage. After more than 2 years of postings news about our small community of Quake 3 (and anything related to Quake), I must say that my heart is not in it anymore. The Quake 3 community is still alive and I always be a part of it but I find myself having less time for this daily job. 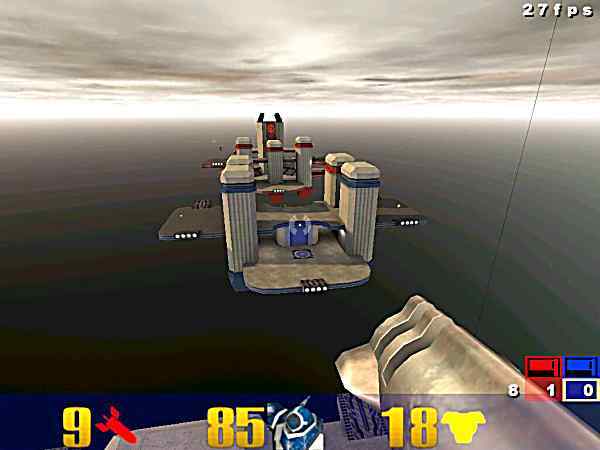 Quake 3 Arena is one of the greatest multiplayer games that I've ever found out and I will always be playing it. With Doom 3 and Quake 4 coming, the hype about these games will go much more higher and Quake 3 will always be there but in the shadows of their successor. The ride has been fun for the last 2 year and even my english improved by doing that. This job gave me the chance to encounter a lot of nice people in the Quake community and I'm very glad for that. All the ressources, the links and the forums on the webpage of Q3Arena.com will be available, don't worry about that. Rocket Arena 3 version 1.75 Beta1 is available. A beta version for Rocket Arena 3 version 1.75 is available for download at the moment. You can check the changelog here for this version and you can submit any bugs found on this forum thread here. This is a beta version, not an offical one. Thank to PQ3.net for bringing this up! The goal of the Burial-Grounds level design contest is to promote intriguing themes for the modern day Quake 3 levels. Here at the Burial-Grounds, we appreciate the visual and audio ambiance that a designer can bring to his/her maps, just as much as we enjoy the technical merit and finely tuned gameplay. The Burial-Grounds level design team have always strived to create thickly themed environments where a player can not only experience fun, unique gameplay, but also encourages exploration and discovery. Your challenge is to create an environment with an engaging theme, thick ambiance and stunning visuals, all without sacrificing gameplay. After all, what good is a great looking map if no one will take the time to play it. So, although the theme and your ability to adhere to it will be the focal point of the overall judging, the levels playability and "fun" will factor in to it's final score. The deadline for the contest is the 18 of april 2004. Can't wait to see what kind of maps we will get from this contest! Sea, project leader and main coder on the TC Reload Network has started a thread on their developpement forum which is a petition for a new point release for Quake 3 Arena. The features he's requesting are mostly oriented for mod devellopers and a couple of good ideas are proposed. Check out the thread for the petition. New g_gear cvar to limit weapons on servers (pistols only, etc). The AK-103 and IMI Negev support the laser sight. New flag models, night vision goggle models and updated the LR300 model. Updated Capture & Hold game play. Knives are now throwable (again). Hit the website of Urban Terror for all the details! Update : It's out, you can get the TC here. The Maps are being designed to be as realistic and possible, to enhance the playing environment and enhance the users perspective of where they are playing. The Grappling Hook from, the Quake II CTF DLL is also being modified to fit the use of the game as well. All this and more are what this game aims to deliver. Check out the screenshots here or download the TC here. New PunkBuster update for the server side of Quake 3 Arena. This update bring a new tool for Quake 3 admin with the MD5 tool. Check out the webpage of EvenBalance.com for all the details. Evillair is pretty busy these days, with his recent textures packs now he just released a new map designed for CPMA for 2 to 4 players. Called The Summoning, the map is trully a good 'ol classic Gothic map. You almost feel at home in there. That remind me of some good Quake 1 map. A good article on the website of Computer Gaming Wold give us the latest news on the devellopement of Doom 3 @ IDsoftware. The author got a presentation fo Doom 3 by Tim Willits and there is a lot of good details if you can't wait to get the game. Screenshots of the weapons are there and the article is 3 pages long. You can read the article here. Evillair is at it again, with a new set of textures for his birthday (happy birthday Yves)! This new set of textures (called the eQ2) is a tribute to Quake 2 and feature 118 textures for Quake 3. The website of IDsoftware just got a small update with the information that Todd Hollenshead and Tim Willits have been granted ownership of IDsoftware. ID is now own by Adrian Carmak, John Carmak, Kevin Cloud, Tim Willits and Todd Hollenshead. Congratulation to you guys! CPMA version 1.2 final is out! This is only an upgrade package and the full version will come soon. This release introduce a new 1vs1 gameplay, the first CTF maps for CPMA ever, 4 new DM maps and 4 bugs where fixed. hit the website of Challenge Promode to get all the juicy details! What happen when you try to apply the law of electronic physic to Quake 3 itself? Well, skOre, on the forum of Quake3World has come up with something rather interresting for mappers out there. He actually took the logic of electronics and apply it with the mapping editor for Quake 3 Arena. The results are pretty impressive and the possibilities for many triggers in a Quake 3 map are rather good. You can get a .pdf version of his essay here or check the .html version here. Warning, this is a technical reading for mappers mostly. Or electronicians also! The beta version of the Threewave mod version 1.7 is out and you can submit in order to try it. If you want to know more about the beta testing, you can check in the IRC channel of #intrstar on the irc.enterthegame.com network. The staff @ Q3Arena.com would like to wish all of you a happy new year and may your wishes become all true! Happy new year for 2004! A new map for Quake 1 in single player has been released by Speed on his website called Mescalito. The map got a lot of monsters, traps and secrets, can't wait to try it out with the Darkplaces engine! A new set of textures was released for Quake 3 today on the website of Yves evillair Allaire, EvilLair.net. This new set of textures, called the eCell, are all based on cell shading technique.. Very beautiful, check out this screenshot of the textures here. Quick note, in order to use these textures you will need to use the compiler tool of Ydnar, Q3Map2. The staff at Q3Arena.com wish each and everyone a very merry Christmas and a Happy Holiday Season! Yep, today is the day that it has been 2 years exactly since I've started posting on this website. Lemme tell ya, time fly for sure! Have fun gang! The newest version of GtkRadiant in the stable release is out, making it version 1.4.0. Nothing too new for this release, hit the webpage of GtkRadiant for your download needs! Just like last year, the Jolt servers (located in the UK) will feature, again, a game of 64 players of Threewave CTF with the Kineterra map. The IP adress is: 195.149.21.141:27960. We have confirmed that new software (Bigpond Toolbar used primarily in Australia) has recently been released which raises pre-existing PunkBuster violation #60045. This violation number has been removed from our system. We encourage PB Admins to give the benefit of the doubt to players and ignore instances of this violation occurring after December 3, 2003.
add: offhand grapple (g_offhandgrapple 1 on server, clients use +button5 to use). add: added matchmode, lockteams and coaching to votes, you need to enable "matchmode" votes by adding 128 to the g_allowVote cvar on the server. fix: fixed timers when pausing the game and connecting/disconnecting afterwards. fix: not all players sent to spectator when matchmode is toggled. fix: removed prediction on shotgun hitting other players shotgun should only draw blood if it actually hits the player. fix: holding fire button with gauntlet doesn't work any longer after respawn. fix: powerups cannot be disabled in portal area any longer. fix: jumppad crashing damage when someone jumps over you. fix: specred and specblue now set the correct forced team model. fix: spectators are now allowed in the portal (for punkbuster). fix: exploit where someone could do follow1 and follow2 in ctfs and arena and not be on a team. fix: promode (pm) model icons are not loaded in team gametypes (uses correct red/blue icons). fix: only failed votes are counted for maximum number of votes- chg: teamed spectators will now hear the last player alarm and the teammate death sound- chg: ripped out the anticheating code, gameplay should be smoother. chg: teamed spectators will now hear the last player alarm and the teammate death sound. chg: ripped out the anticheating code, gameplay should be smoother. chg: improved networking of CTFS and ARENA events (no more double restarts). No word about the release date on the next version of Threewave CTF, but rest assure that I will let you know about that.